Arrival at Queen Alia International Airport, you will be transferred to Dana for dinner and an overnight stay. Transfer to Showbak. About 1 hour drive from Dana village. Start the hike between 5 or 6 hours with a very beautiful view and landscape in a natural reserve with many different kind of trees. The hike will be with donkey for the children. Arrive afternoon to Al Whidat camp in the mountains with Bedouin family with Bedouin tents. After breakfast, start the hike to little Petra by donkey through Al Farch, beautiful view of the desert and of the mountains of little Petra. By the way, we will meet a lot of local Bedouins living in the region. There, we can stop and see how they are living. By the evening, arrive to little Petra from the back way. 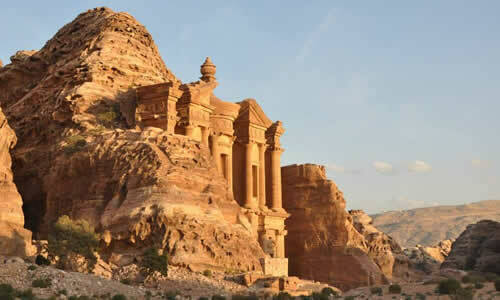 From there, visit little Petra and camp with Bedouin family. 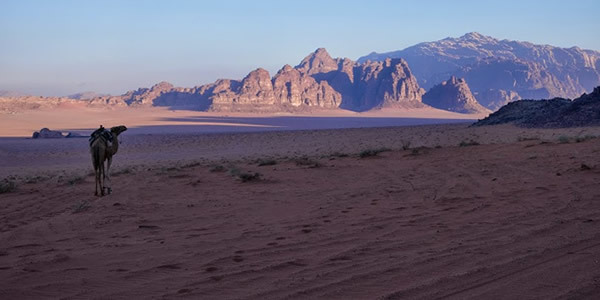 After breakfast, start the hike with donkey to Petra by beautiful cliffs from the back door to monastery or Al Dier with a beautiful view of the site. 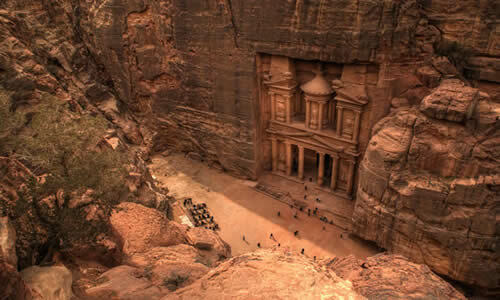 Arrive to the monastery and then visit the site of Petra for the rest of the day and visit Bedouin family in the cave. Overnight camp in a cave with Bedouin family. After breakfast, visit the high Place of Sacrifice and wadi farasa (lion fountain, tomb of romain solider,the garden salle) to enjoy the view from the top of Petra. 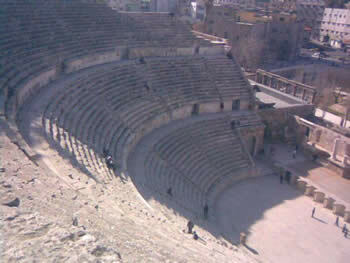 There we can see the treasury from the top of the mountains and the Roman Theater and Royal Tombs. In the afternoon, visit the treasury called AL Kaznhay and then back through one of the most beautiful canyon in Petra (the siq) 1200 meter back to the hotel in Wadi Musa. Dinner and Overnight in a hotel . 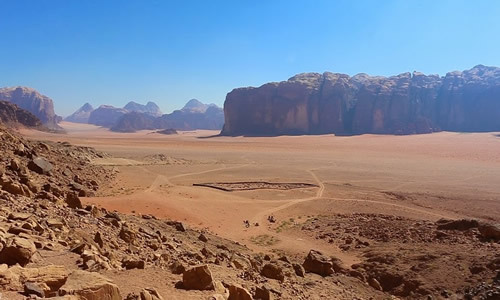 After breakfasttransfer from Petra to the magical site of Wadi Rum, to enjoy the desert by jeep car with Bedouin driver, you will visit Lawrence spring, Al Khazali, Umm Fruth, Lawrence house, Sand Dune, Burdah Mountain, Anfaishiyya Inscription, Barrah Canyon, thendinnerand sleep underthe beautifulstarsorin tents. 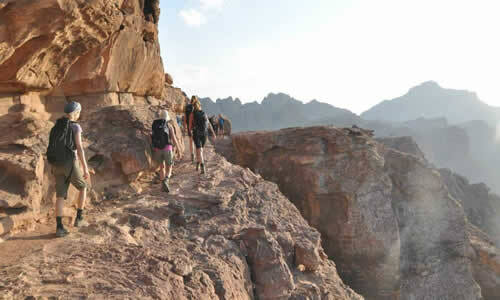 Breakfast then start you day to discover wadi rum hiking thendinnerand sleep underthe beautifulstarsorin tents. 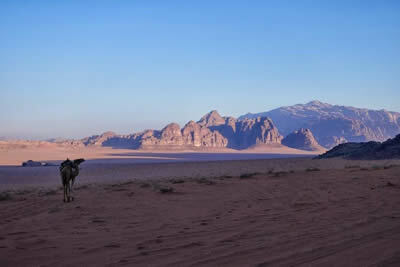 After breakfast, we drive with the jeep back to the Wadi rum village. 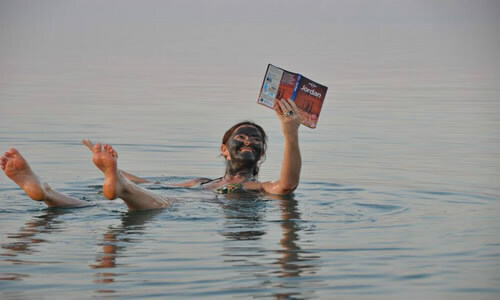 From there, we will drive to Aqaba for swimming and relaxing for the rest of the day. In the evening, we drive to the desert highway to Madaba. Overnight in a hotel. 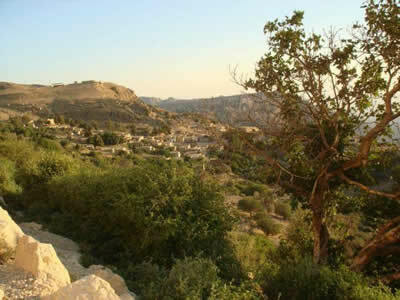 After breakfast, visit the site of Madaba like Saint Georges and Mount Nebo.